My dogs eat Evanger’s Dog Food everyday. It’s their favorite food and we like that it’s made in the USA and from very few ingredients. No additives, no artificial preservatives just happy food. From handpacked canned food, dry food and treats you can purchase everything you need to make you and your dogs happy and healthy. Evanger’s utilizes high-quality, inspected meats to make highly palatable and nutritious foods that will satisfy even the most finicky eater. With no soy, corn, wheat, artificial ingredients, preservatives, harmful additives or by-products, Evanger’s canned meals make an excellent mixer to our dry foods. Not only do they offer your pet a variety in taste, our gourmet dinners offer the additional nutritional benefits your pet needs. Natural Vitamins and minerals are blended with the wholesome quality meats for ultimate nutrition that are completely balanced meals for all life stages, ages, and breeds. This is the canned food my dogs and cats love. I serve it to them every day, just a spoonful or two in their food. The Hand-Packed Specialties are processed as to maintain the shape and nutrition of each recipe’s contents – whether it is a whole fish dinner or choice chicken parts supplement. *The cooking process softens those recipes with bones – making them edible, safe, wholesome and highly digestible. Our fresh, natural and superior ingredients (no by-products) ensure top quality. Try our Hand-Packed Line and make meal time a palatable pleasure that optimizes your pet’s health! Your pets will go nuts over this food and it smells great. My boyfriend always says it smells like fresh cooked meat when I open the can and he looks at it like it’s something he can eat, lol . The Sardine flavor my dogs didn’t so much like, but my cats did. My dogs never seem to like fish unless it’s salmon So I feed this to my cats every night along with their dry food. 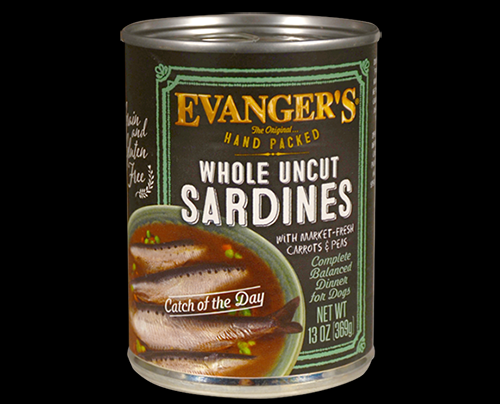 Evanger's Whole Uncut Sardines is formulated to meet the nutritional levels established by the AAFCO nutrient profiles for all life stages. Puppies, pregnant and nursing dogs may require 2-3 times above amounts, and reduced for less active or older dogs. Amount of food your dog requires depends on activity, age, environment and breed. Our dogs go NUTS over the Whole Chicken Thighs food. It’s really a whole chicken, bones, skin and all inside the can. The smell is delicious, the taste… well I don’t know since it’s for my dogs, but if I asked them, they would say DELICIOUS! Evanger's Whole Chicken Thighs is Grain-Free and Gluten-Free, and makes a great complement to our Super Premium and Grain Free dry foods. It can also be mixed with Evanger's canned Vegetarian Dinner to make a complete, balanced, and very nutritious diet. Whole Chicken Thighs is endorsed by the cRc Kosher for Passover. Our dogs also go nuts for the wild salmon, cats too. It contains no preservatives or fillers. Meaty pieces of salmon served in a gravy. Evanger's Wild Salmon is Grain-Free and Gluten-Free, and makes a great complement to our Super Premium and Grain Free dry foods. It can also be mixed with Evanger's canned Vegetarian Dinner to make a complete, balanced, and very nutritious diet. Salmon is endorsed by the cRc Kosher for Passover. Make your pets happy this holiday season and all the time with Evanger’s Dog and Cat Food. Click HERE to purchase online or look for their line of products in your favorite pet food store.